Easier - Canada is the northern neighbor to much of the United States. Canada is the second largest country in the world. Only Russia is larger. 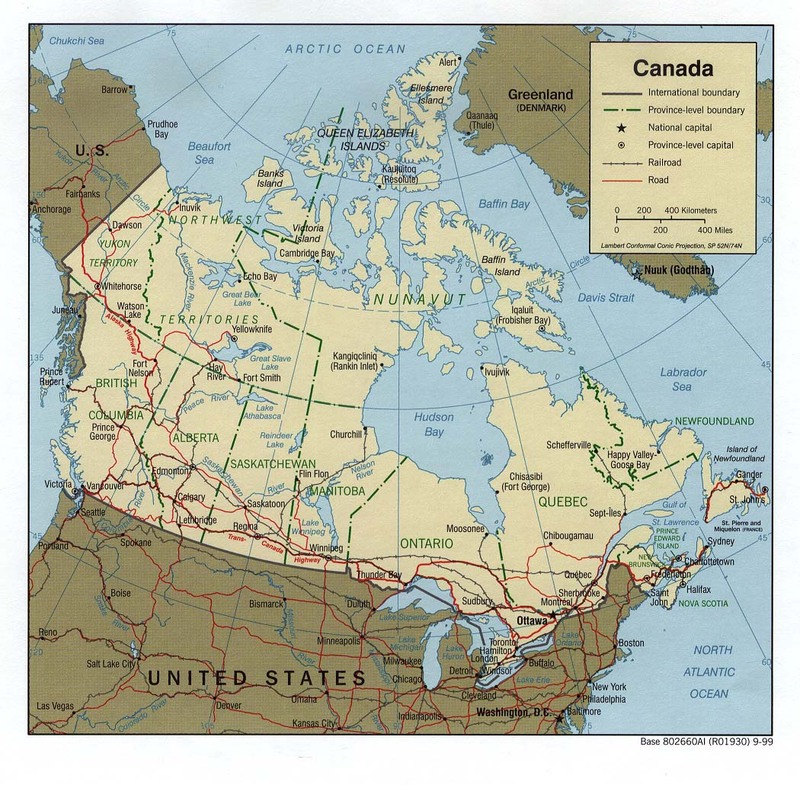 Canada is slightly larger than the United States but has about one-tenth as many people. Three-fourths of all Canadians live within 100 miles of the U.S. border. Because of rugged terrain and harsh climate, much of the rest of Canada's lands are thinly populated. The city of Ottawa is the capital. Toronto is the largest city. Both cities are in the province of Ontario. Harder - Canada is an independent, self-governing nation - - a federation or union of ten provinces and three territories. The Constitution Act of 1982 continued recognition of the British monarch, Queen Elizabeth II, as the queen of Canada. The position symbolizes Canada's historic ties to the United Kingdom which entirely ruled Canada until 1848. At that time, Canada began to gain some control of its domestic affairs; however, the UK continued to govern Canada's foreign affairs. In 1931, Canada became a fully independent nation. Like other large, diverse nations, maintaining a sense of community among its peoples is one of Canada's major challenges. About one third of all Canadians are descendants of European Americans from England, Ireland, Scotland, and Wales. Other large ethnic ancestry groups represented are Germans, Italians, and Asians. The latter live largely in Ontario and western Canada. A fourth of the country's population have some amount of French ancestry; French Canadians are near eighty percent of Quebec Province's population. The Canadian government recognizes both English and French as official languages; however, Quebec has made French the sole official language of their provincial government. Native people, American Indians and Inuit, comprise a small percentage of the nation's population. In addition to its diverse people, Canada houses a wealth of natural resources. European settlers discovered a land of clear lakes and rivers, prairies, and forests that supported vast numbers of game and fur-bearing animals. There were rich farm lands and coastal fisheries. The forests became important sources of timber for shipbuilding and construction. Today, Canadian forests make Canada the leading producer of paper for newsprint. Its fertile soils help to rank the nation as a leading producer of wheat. Canada also is a leader in the generation of hydroelectric power. The country also has abundant deposits of petroleum, iron ore, and other minerals that provide the raw materials to maintain Canada as a leading manufacturing nation. This site has information on Canada's leaders, geographics, and other Canadian stuff. Rather than structuring information around more traditional categories like Geography or History, this site organizes its categories into broad and interdisciplinary sectors: institutions, people, regions, and the arts. This is the official site for the government of Canada (In French and English). This website aims at defining Canada's multicultural fabric, history, symbols and values. After visiting several of the websites containing information, resources, and photographs about Canada, complete one or more of these activities. Test Your Knowledge of Canada. Select from over 60 irreverent quizzes and find out if you are a real "Canuckelhead"! Go to the Canucklehead Quiz from The Canadian Encyclopedia (http://www.thecanadianencyclopedia.com/canucklehead/Welcome.asp?Language=1). As an alternative activity, create your own original Canada quiz. Test it out with your friends, classmates, and/or family. Enter The Canada Day Poster Challenge. Each year, students 18 years of age and under are invited to take part in the Canada Day Poster Challenge by designing a poster illustrating their pride in Canada and in being Canadian. The theme of the 2003 year's entries was centered upon Canadas natural beauty. You can learn about this annual competition for Canadian school students by visiting the Canada Day Poster Challenge (http://www.pch.gc.ca/affiche-poster/). Plan A Two-Week Trip To Canada. You may want to visit (1) Canada Tourism (http://www.canadatourism.ca/), (2) Travel Guide for Canada (http://canada.worldweb.com/) from WorldWeb, and (3) Travel Canada (http://www.travelcanada.ca/) from the Canadian Tourism Commission. Other resources you may wish to consider are (4) VIA Rail Canada (http://www.viarail.ca/), (5) Air Canada (http://www.aircanada.ca/), and Greyhound Canada (http://www.greyhound.ca/). Develop a detailed itinerary for your Canada tour and a schedule of estimated expenses. Check out websites created by students about everything Canadian including government, history, First Peoples, geography, and more. This student project has information on the dress, food, location, religion, housing, and language of the Blackfeet, Iroquois, Inuit, and Haida people. This website will inform you of the effects that the Great Depression had on the country of Canada and its people. It was around 9:04 on December 6th 1917 when the actual explosion happened. Learn more at this class project site. "Mummering" is a very old Newfoundland custom that dates back to the time of the earliest settlers who came to our land from England and Ireland. This site everything you could want to know about the history of British Columbia. Explore this extensive online collection of historical Canadiana. This site includes a timeline of the country's history along with documents, an art gallery, and much more. Here you find information on the names of Canada's provinces, territories, and capital cities; origins of some Aboriginal community names; and a variety of articles on interesting names across the country. Here you find an extensive links collection for Canadian history. Founded in 1670, the Hudson's Bay Company's (HBC) chief interests for its first two centuries were the fur trade, exploration and settlement. Learn about life during Ontario's early days with this site made for grade school children. The creation of the Territory of Nunavut and the finalization of the historic land claim settlement between the Nunavut Inuit and the Government of Canada adds a new dimension to the evolving history of both Nunavut and Canada. Learn about the lives of women in Canada. Here you can find information on the plants, animals, and habitats. Here you can access tons of information on the plants, animals, and fungi that live in the arctic region of Canada. The site includes Arctic images, news, and research updates. Here you find the documents that helped create the country of Canada. Website companion to the print magazine, here you can find articles, maps, travel information, photographs, and more about Canada. This institution is responsible for national policies and programs that promote Canadian content, foster cultural participation, active citizenship and participation in Canada's civic life, and strengthen connections among Canadians. This is a nonprofit trade and lobby organization, representing Canadian daily newspapers (English and French). This is an online news source of Canada from a radio and television network. Here you find information, activities, virtual postcards, and more on Canada's special days, including National Aboriginal Day, Saint-Jean-Baptiste Day, and Canada Day. Learn about this sometimes forgotten forest, one of the rarest and most endangered types of ancient forest in the world, a coastal temperate rainforest. This collection contains historical bird's-eye view maps of Canadian provinces. Permafrost underlies about half of the ground surface of Canada, and it may be more than 500 metres thick in the far north of the country. Learn about this trail that will make its way through every province and territory. Consider how hockey tells us about Canada's economic system, about French/ English and Catholic/ Protestant tensions, the Canadian identity, government's roles in recreation, leisure, and professional sport, and the Canadian experience. Here you can read young Canadians' ideas about what kind of world they'd like to live in. Founded in 1967, this organization works to save the animals and endangered elements in nature. Students will explore the identity of Canada in this unit study. They will learn about its geography, that is, its landforms, river systems, climate, and vegetation. They will also learn about places within the country, its national and regional symbols, and its people, especially, heroes. The purpose of this unit is to increase student awareness about cultural diversity in Canada. This unit plan introduces a study of Canada. Students research and gather information through a series of challenges and quests on the provinces and territories of Canada. They learn about the location and and characteristics of the physical regions of Canada, and investigate the exchange of goods and resources among them. Here you find a collection of lesson and unit at both the elementary and secondary grade levels. Canada Day French-Canadian Premier New France "O Canada" "Mounties"
Created by Annette Lamb and Larry Johnson, 8/03.